If you're a long-time reader you know I am somewhat of a hot cocoa snob. I know what restaurants serve the best (Bob Evans - but do not, under any circumstances, look up the nutritional information), I have to doctor up gas station hot cocoa (two creams plus one chocolate cream if available), and I have been known to hide the "good stuff" in the back of the pantry. I haven't seen Drinking Chocolate in any store lately so I had to resort to something else. The boys all love hot cocoa as well and while I have found some super fantastic recipes that involve heating milk and melting chocolate (sister doesn't lie when she says it's the best ever - try it this Christmas), my time allotment and wallet require something simpler, like heating a kettle of water. Something they can do themselves when needed. So we reverted back to the powdery packets of ho-hum. But I quickly tired of tasteless tan liquid. I searched for recipes on Pinterest, Food Network and allrecipes but who to believe? Recently I beseeched my Facebook friends for their favorite, tried-and-true hot cocoa mix recipe. And one came up a near winner! 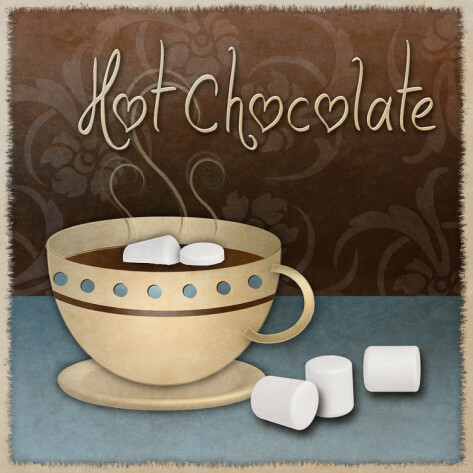 Now because, when drinking hot cocoa, taste and texture matter much more than calories, we tweaked the recipe a bit and added more chocolate. And if you're worried about clean eating and limit your children to real food, you're definitely going to want to skip this recipe. But if you're looking for a hot cocoa mix with a lot of flavor and a great mouth-feel....here's your recipe. Also, too, there are hardly ever powdery bits at the bottom of your cup with this recipe. Mix together and store in airtight container. Add ¼ c. mix to each 6 oz. water. Top with marshmallows or whipped cream. If you are adventurous, add a tablespoon or two of cinnamon to the batch (I'm the only one here who likes cinnamon in my hot cocoa (and my chocolate chip cookies) so I just shake a little in my cup when I prepare it). If you decide you have already long ago derailed the train called Self-Control, add a dribble of real cream when you prepare a cup. And, as a side note, I always thought dry powdered milk was supposed to be cheaper than regular milk? I only buy a box every year or two but egads - it's way more expensive than I remembered. I think I calculated the total cost of this recipe to be around $11.00 and it should yield about 66 servings.